"crack tarts" that's really what these should be called as they are hard to put down and walk away from. These were just lovely to make. They lasted a mere day in the house--record breaking. I will admit they were time consuming, but oh so worth the effort. In reality what perfect tasting pastry isn't very time consuming? The expressions on people's faces when they bit into them for the first time--oh how I wish I could just bottle that up. My favorite part? Those crispy, buttery, sugary edges! Whoa Nelly those are addicting. One could easily just make "edges", sell them and make millions. You know? I have to say I am not good at measuring out the dough into rectangles. You need a ruler and stuff for that. Did I follow it? Of course not! I had to go my own dysfunctional way. But they still came out mighty fine. Other notes: of course I did some changes, you'll see them in colored parenthesis. The original recipe comes from King Arthur, I think. Always keep that dough nice and cold. I like to use a cheese grater on my butter, keep it in the freezer until ready to use. In a small bowl, beat the egg and milk together. In a food processor, whisk together flour, sugar and salt. Add in the cold butter, pulse until you have nice crumbles. Pulse in the beaten egg with milk until just mixed—no overmixing! Lightly dust a clean counter with flour and knead the dough on the floured counter for a few turns until it really starts to come together. Divide the dough in two, wrap in plastic wrap and refrigerate for about 30 minutes. In a bowl mix all of the ingredients, well. Store in fridge till ready to use. This next part is where you need to pay attention; I was horrible at this. Get your baking pans ready (2 – 3 pans) by lining with parchment paper, set aside. On a well floured work surface, press dough into a 3x5-inch rectangle, roll the dough out to about 1/8-inch thickness. The dough should be slightly larger than 9x12-inches. Trim dough with a pizza cutter, creating a rectangle that is 9-inches tall and 12-inches long. Using the pizza cutter, cut each side into thirds, creating 9 squares. Place dough squares in the fridge while you roll out the second piece of dough in the same way. Brush one set of 9 squares with beaten egg. This will act as the glue for the top layer of dough. 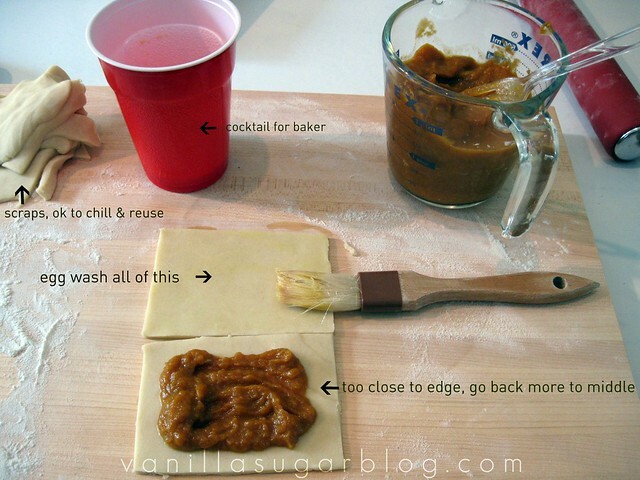 Spoon about one tablespoon of pie filling into the center of each brushed dough square. Top with a piece of dough and use a floured fork to crimp the sides closed. Use the tines of the fork to create vent holes in each tart. Recipe from dawn finicane of vanillakitchen.blogspot.com Place the pan in the fridge to let it get firm again; you don’t want to bake these with warm dough, they won’t crisp up. Keep in fridge at least 30 minutes. When ready to bake preheat oven to 350 degrees. Bake for about 20 – 25 minutes or until the tops and edges are nice and golden brown. Cool tarts on wire racks. You can let them cool before glazing or not, I didn’t wait. But if you glaze them straight away, you do need to let the glaze harden before serving. Make sure to sift the powdered sugar, you don’t want any lumps in the glaze. Mix all the glaze ingredients really well and apply with a spoon over the racks. Let glaze dry on the tarts before devouring. Gorgeous pop tarts, and take a look at the pastry! 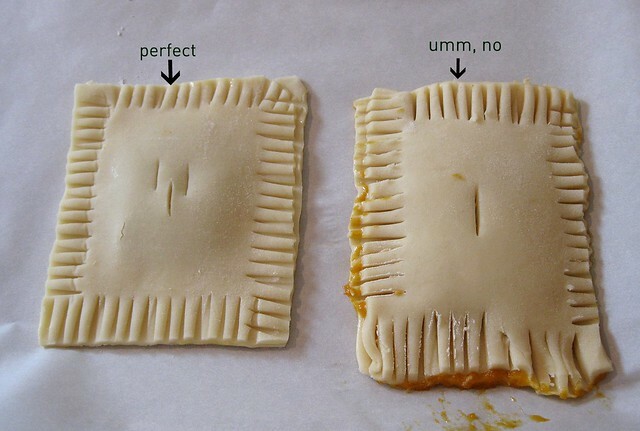 WOW, it's flaky beautiful. I keep the butter in the freezer too, and just grate it right out of there.Did it for Ottolenghi's puff pastry I made this morning. Que fantastico relleno, me encanta. ESto me lo copio. Wow Dawn, these do sound good! I love that you filled them with pumpkin! That is awesome! That looks delicious! I've been eying her recipe...but I couldn't decide whether I should make it or not. Now, I think I should. I think I'll try it out without the pumpkin spices or any of the other ones other than cinnamon because I only have cinnamon. Do you think that would be alright? Those look so awesome! A million times better than boxed poptarts! I never would say this sentence out loud, but "Those looks divine!". Seriously, they're gorgeous. Those flakes look amazing! Theese are some seriously glorious pop tarts. I can't think of anything that I'd rather have for breakfast. i'm sure homemade poptarts taste sooo much better! i want to try these! Crack tarts. I love it! I'm drooling over here! These look perfect! Love it - can see myself making these for my children - fab! oh pop tarts...I always want to buy them in the store because they appeal to me conceptually...then I remember that they don't taste as good as I think and talk myself out of them. Homemade must be better! And pumpkin - yum! Those are like perfect little works of art! Even the imperfect one. So damn cute! OOh, ever since Joy posted these I've wanted to try them. I love your little notes on the photos. :) I too, tend to bake with drink nearby. Why not, right? Pumpkin beer would be quite seasonal to drink while making these little guys. OMFG! those are dangerous. Did you leave out the API es because you don't like them? I can see adapting the recipe for something like apple butter, or perhaps using chai spice. Oh, how wicked, I would not be able to resist! Um, dysfunctionality, no- they are perfect. And I bet they were very addictive. Pumpkin no less. As Erica said =) I made these too =) And Holy pumpkin! These things are mighty addicting! I agree, they were a little time consuming, but man homemade pastry is so much fun to make! Crack tarts.. I am all over those edges too! Love the name and boy those do look delicious! THOSE LOOK UNBELiEVABLE. i looove spiced pumpkin things, so a pumpkin-stuffed pastry with sugar glaze sounds so, sooo good. high five. OMG!!! These were the best poptarts ever!!! Please save the remaining ones for me for dessert tonite!!! 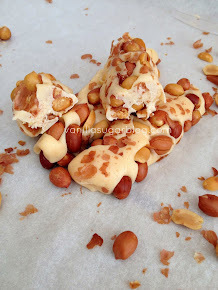 You need to make these again with different filing to try it out!! Hmmm - these tarts could not look more delicious. And I love that you bake with a cocktail. May need to incorporate that into my baking as well. Girl, are you crazy? I could eat every single one of these! Standing ovation over here! Ummm, send some my way, please! These look amazing! I love pumpkin and inside a flaky poptart shell it would be a million times better! Crack tarts sounds about right. 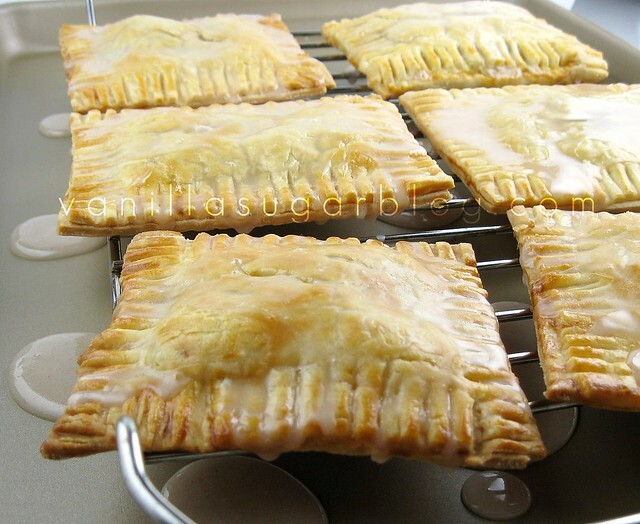 These look delicious - I actually thought about making pumpkin pop tarts about a month ago and, like most ideas I randomly get during the day at work, never got around to them. Good to know there is an actual recipe around! Ooooooooh yeah! Yum yum YUM!!!!! Dawn...this is why I love you! "Cocktail for the baker". That's how I roll too! You did a gorgeous job on the pastry and I liked how you the little captions on the photos. You know if I made these that cup would be filled to the top! I'm loving the crispy edges. You outdid yourself once again. LOL @ crack tarts. I'm sure something labeled like that would sell. These sound wonderful! send one of those babies my way! WOW!!! These will make great holiday gifts. *hi five on the edgy loving! They are totally crack tarts! I love anything with pumpkin. The edges are definitely the best part on these beauties. ok. i don't like poptarts but i love pumpkin so i bet i'd love these! yum!!! Homemade is always better, and in this case sounds 100x better! Can't wait to make these one day when I have time! I have never let my kids have Pop Tarts because I know that would be the end of healthy breakfasts for the rest of their lives. Homemade though? Maybe. Or maybe just for mom. Wow, those look terrific and I love the flavors. I am TERRIBLE at measuring type things too. I've realized that when something is this amazing, no one cares. MMMMMM,..home made tasty pumpkin square tarts, dear Dawn!! Waw!! Thanks for thetips & tricks too! They look just so festive too! These pumpkin pop tarts look like they were sooo worth every bit of effort. Love pumpkin everything over here. I just made these this morning, and they are as amazing as I hoped they would be! The crust was all flaky deliciousness, and my fiance loved them :) Thanks for posting this recipe! These have been on my list for awhile- well, not the pumpkin version, but the ones filled with cinnamon and sugar. 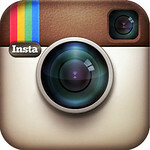 BTW, I like your little comments on the pics. sounds great! cant wait to try thanks for the ideas!!! These look delicious! I'm linking to my blog (with full credit/linkage, of course). So yummy! I was over the moon when I saw pumpkin pie poptarts in the store this year! These look a million times better. 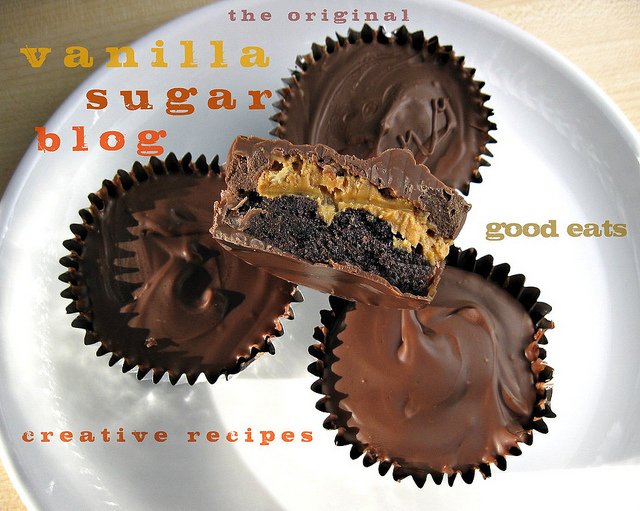 Thanks for stopping by my blog :) Your blog is mouthwatering. Wow, these would definitely bring me back to my childhood...If in my childhood I ate homemade pop tarts filled with pumpkin. YUM! The pop tarts are so nice. They looked so pretty. I have never made something like this. Thanks for sharing this nice recipe to me. 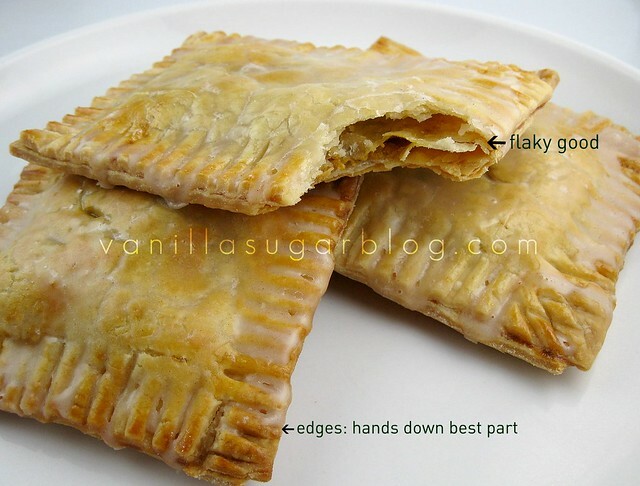 Just made these pop tarts with my kids. Cant wait to bake and est!! My son thought of it before I found this recipe and I thought it would be a great Thanksgiving Breakfast treat! Yum!